Me and My Dog Have Earned Our Certificate! Me & My Dog Classes! 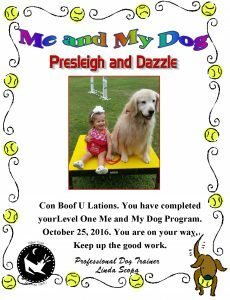 Come join the fun with Presleigh and Dazzle and and earn your MMD Certificate. Be the first person (and dog!) to be on our MMD Certificate page! This website uses a GeoTrust SSL certificate to protect online transactions with the highest strength encryption.